You will earn 19,951 Reward Points. Earn 1 reward point for every 1 dollar spent. The R & A Series represent Traulsen's Top-of-the-Line product offering. 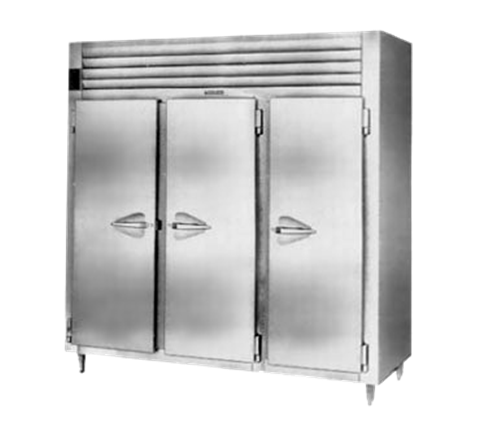 The “N-Width” pass-thru refrigerator models are all designed to offer maximum interior storage capacity within a slightly narrower left to right footprint. Each is supplied standard with such high quality features as balanced refrigeration systems, microprocessor controls, communications ability and stainless steel exteriors. Additionally, they offer the widest range of optional accessories to choose from, and can be specified for use with many different applications, including: Foodservice, Correctional, Institutional,Export, etc. Cabinet exterior front, one piece sides, louver assembly and doors are constructed of 20 gauge stainless steel with #4 finish. Cabinet interior and door liners are constructed of stainless steel (anodized aluminum in the A-Series). The exterior cabinet top and bottom are constructed of heavy gauge aluminized steel. A set of four (4) adjustable 6" high stainless steel legs are included. Doors are equipped with a gasket protecting metal door pan, removable plug cylinder locks and guaranteed for life cam-lift, gravity action, self-closing metal, glide hinges with stay open feature at 120 degrees. Hinges include a concealed switch to automatically activate the interior incandescent lighting. Guaranteed for life, work flow door handles are mounted horizontally over recess in door which limits protrusion from door face into aisleways. Doors have seamless, polished metal corners. Gasket profile and Santoprene® material simplify cleaning and increase overall gasket life. Anti condensate heaters are located behind each door opening. Both the cabinet and door(s) are insulated with an average of 2" thick high density, non-CFC, foamed in place polyurethane. A top mounted, self-contained, balanced refrigeration system using R-134a refrigerant is conveniently located behind the one piece louver assembly. It features an easy to clean front facing condenser, thermostatic expansion valve, aircooled hermetic compressor, plenum effect blower coil, large, high humidity evaporator coil located outside the food zone and a top mounted non-electric condensate evaporator. Biased return air duct protects against introduction of warm kitchen air, promoting even temperature maintenance and efficient operation. A 9' cord and plug is provided. Standard operating temperature is 34 to 38°F.